The Royal Decameron Montego Beach Resort has a great location in Montego Bay, within walking distance of shopping, dining and nightlife. When you stay at Royal Decameron Montego Beach in Montego Bay, you’ll be near the airport and minutes from Doctor’s Cave Beach and Cornwall Beach. 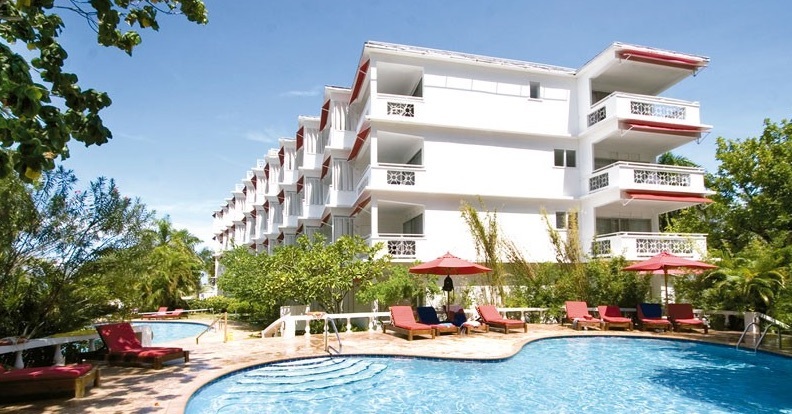 This all-inclusive resort is also located near Dead End Beach and AquaSol Theme Park. Royal Decameron Montego Beach guest rooms feature ocean views, most from private balconies or patios. All rooms have fully-equipped bathrooms, TVs, air conditioners and ceiling fans, irons and hair dryers. Spend the day on the private beach or dip into one of the two outdoor swimming pools. Additional activities include dance lessons, aerobics and non-motorized water sports like kayaks, sailboats and diving lessons in the pool. The resort also offers nightly entertainment and a disco. This resort is all inclusive. Rates include meals and beverages at onsite dining establishments. The hotel has two restaurants, PassaPassa and Souk, serving a variety of international and regional dishes. There are also several bars and lounges, including a swim-up bar at the pool.